This year marks the 25th anniversary of the declaration by the United Nations of 17 October as the International Day for the Eradication of Poverty. We have still a long way to go for making this world poverty free .One of the key strategies for eliminating poverty is focusing on women and girls. Achieving gender equality and empowering women is not only the right thing to do but is a critical ingredient in the fight against extreme poverty, hunger and malnutrition. We live in a world in which women living in poverty face gross inequalities and injustice from birth to death. The global statistics on poverty are numbing. The real brunt has always fallen on women and sometimes it is very cruel with them. Gender discrimination continues to be an enormous problem within Indian society. Traditional patriarchal norms have relegated women to secondary status within the household and workplace. This drastically affects women’s health, financial status, education, and political involvement. Women are commonly married young, quickly become mothers, and are then burdened by stringent domestic and financial responsibilities. Poor women’s suffering has long been a surefire way to pull on the heartstrings of rich donors, but in recent years there has been a newfound appreciation for the role that these women play in breaking the cycle of poverty and stabilizing fragile societies. Research suggests that by serving a girl at the vulnerable crossroads of adolescence, development programs can have the greatest impact not only on that girl, but can empower her to be a catalyst for change in her family and community. By ignoring them we have lost the opportunity to impact a generation. However, once that window of adolescence closes, we have opened the doors for another broken generation .One must remember that it is easier to build a healthy generation than repair a broken one. Societies that invest in and empower women are on a virtuous cycle. They become richer, more stable, better governed, and less prone to fanaticism. Experience worldwide shows s that when women have opportunities, the yields on their farms increase — also their incomes. Natural resources are better managed. Nutrition is improved. And livelihoods are more secured. Further when a woman receives money, her extended family usually benefits, as any profit percolates down and brings about the greatest amount of good to the greatest amount of people. We create the most powerful catalyst for lasting social change. When women access financial services, investments in child education and health tend to rise; households save more and cope better during times of distress. Even in traditional societies, no matter how oppressed women are or the degree of literacy, they are often the stewards of family savings. Providing women with more and better opportunities to fulfill their social, economic, and political roles is now deemed so essential for reducing poverty and improving governance that women’s empowerment has become a development objective in its own right. In order for a woman to be empowered, she needs access to the material, human, and social resources necessary to make strategic choices in her life. Not only have women been historically disadvantaged in access to material resources like credit, property and money, but they have also been excluded from social resources like education. Aid has often been most effective when aimed at women and girls; when policy wonks do the math, they often find that these investments have a net economic return. This spending creates a powerful ripple effect throughout society and across generations. We have for long made paternalistic decision to “protect” these women, thereby eliminating their ability to solve issues that they face. Why couldn’t they decide for themselves how to manage their own situation? Why couldn’t we equip them to decide how they can take their own decisions? The key levers for change, from the ground up, are clearly female education and women’s access to income. 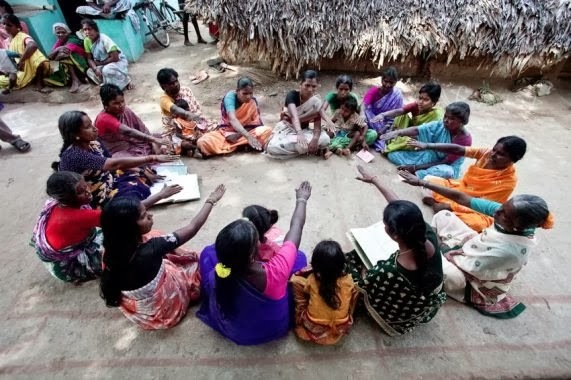 In the new development discourse women have come to be recognized as key participants in efforts to alleviate poverty and achieve social transformation. Effecting comprehensive change from a woman’s point of view calls for a transformation of gender relations, not merely superficial attention to “women’s needs”. Women and families the world over work tirelessly to end the poverty and hunger in their lives. But it can take much more than hard work. They need new tools to create their own paths forward. They need opportunities that can overcome economic, cultural and gender barriers. It needs multissectoral cooperation to create breakthrough ideas and breakthrough solutions that can break down economic, social and technical barriers. For all interventions, the fundamental logic is plain: if we are going to end extreme poverty, we need to start with girls and women. They are the ones who have the grit to lift families out of the pit. People who have pioneered successful social programmes recognized this potential and sought to evoke it. Empowerment has many dimensions–social, economic, cultural, political and personal. When every part is treasured, the good unleashed is greatest .This is the unique philosophy the new movement for empowering the females. “Women hold up half the sky,” in the words of a Chinese saying. The wisdom has dawned on us only now. Women are combination of nature and energy. They procreate future links and nourish a prosperous and progressive family, society as well as world. Their happiness determines the happiness of a family and particularly peaceful family life. It is evident that ‘women are economic factors: They produce and process food for the family; they are the primary caretakers of children, the elderly and the sick; and their income and labor are directed toward children’s education, health and well-being.”Women hold up half the sky,” In a study of Female Domestic Help of Kolkata, it was found that their employment and earning had been changed their daily family life in terms of daily needs i.e. food, shelter and cloths, etc. It was also observed that all of them were supporting their children’s education. The children of 60% maidservants were attaining high school and completed secondary and higher secondary examination. The offspring of 20% informants were attending college for their bachelor degree in general stream and it excluded the children of 5% informants who were in technical education. Another group of children of 10% informants were in their university for post-graduation. Further, they were conscious about self-care, but it was second priority because their family management with children care and development were significantly primary. On the other part, they were taking decision in their family and at their work place alone. Their interaction and affiliation were turned their participation in development of their community, politics and their own agencies for collaborative action. We observed that in their employment, there was no social security measure at their postretirement. It was strictly “no work no pay” basis. They almost spent their earning for their family including children’s education and so on. But if their children would disagree to look after them at their later life, they might face survival crisis. So, there is need of such scheme for saving for their later life and secondly there is need of secular education(skill information in relation to agricultural production and industrial technology) for their safety and security at elderly days.